Los Arqueros Golf & Country Club is located a few miles inland from the fashionable resort of Puerto Banus and it was here on the Costa del Sol that Seve Ballesteros first took the plunge into golf course design back in 1990. 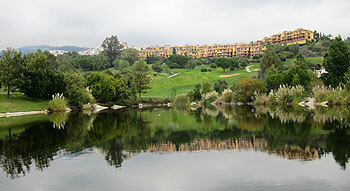 Like most of the courses concentrated in this part of the Costa, the fairways at Los Arqueros compete with real estate for the available space and unfortunately, housing has encroached on the layout, particularly on the front nine. Nonetheless, there are plenty of challenges on the course (such as water hazards, doglegged fairways, out of bounds, multi-tiered greens, uphill and downhill holes) to keep golfers concentrating on the job in hand rather than worrying about their surroundings. Both par threes on the front nine are very good (the 2nd plays downhill and the 5th has a two-tiered green) whilst the par five 13th is regarded as the signature hole on the card – starting from an elevated tee, the narrow fairway veers right to the green, falling away steeply on that side. Anyone who adopts a Ballesteros persona and takes the pin on by cutting the corner with their second shot will be advised to play a fade down the left in order to avoid a lost ball on the other side of the fairway! Tigth and hilly course located in a residential area. Short at only 5300 meters from club tees, but you need to hit it straight, in places the fairway is no more than 15 meters wide. You need careful consideration to get the club selection right since you are faced with uphill and downhill approaches, most often from a sloping lie. Great test of accuracy and imagination. Notable holes 3,7,8,12 and 16. I particularly liked the 3rd, medium par four with a challenging teeshot with water along the left of the narrow fairway, approach from a sloping fairway to a elevated undulating green with trouble both left, right and to the front. One more.... Some many courses around the area in the middle of mountains with not the best designs. I am sorry for Seve but this course is not the best. It is unfortunate for it that I played it after attending the 2007 Volvo Masters at Valderrama, so what I have to compare doesn´t help!! I cannot remember much of it, except a drivable par 4 (I think it was 14th), so that is not good. All the same friendly staff and excellent menu at the bar! This is a really fun golf course, that is also challenging. Its the tightest golf course I have ever played with deep canyons or rock faces gobbling up any tee shot that dares to go slightly off the fairway. You need to be open minded to play around here as it seems unfair at times, but there are some super holes in typical Seve fashion. There are reachable par 5's that do offer you some birdie chances. Play here if you get the chance its difficult but great fun and interesting at the same time. Bring lots of golf balls!! Recommended for great fun holiday golf.